Scholastica | How do I manage manuscript tags? Manuscript tags can be applied to individual manuscripts and are only visible to editors. Tags are helpful for grouping and searching manuscripts on the manuscript table page. Say you would like to change all manuscripts currently tagged with "constitutional-law" to instead be tagged with "con-law". You can accomplish this by renaming the "constitutional-law" tag. To rename a tag, click the edit icon within the "Manage manuscript tags" table and complete the form. When you delete a tag, it will be removed from all manuscripts where that tag is present. 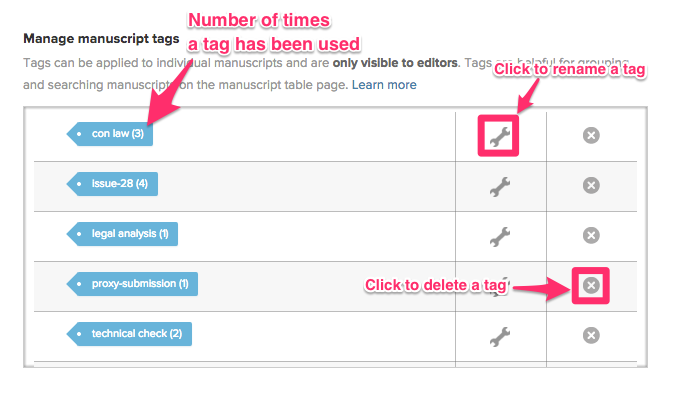 To delete a tag, click the delete icon in the "Manage manuscript tags" table.